Live Bait fishing adventure -Enjoy fishing the magnificient Whitsunday bays and inshore islets aboard our sportsfishers. Our experienced fishing guides begin the tour by throwing a cast net for live baits such as mullet, prawns, or sardines which are then used as live bait on each rod. 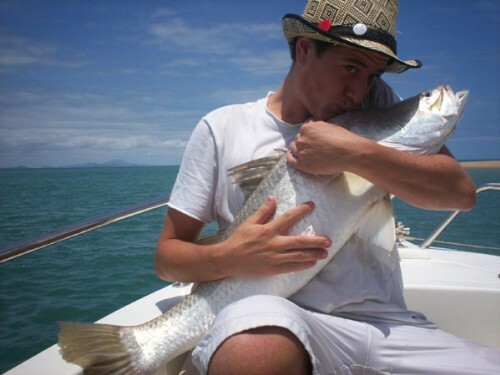 We target species such as Barramundi, Queenfish, Golden and Giant Trevally, Cobia and many more. Our experienced and patient fishing guides will assist you as you ‘catch your fish’, even for the ‘youngest’ or the least ‘experienced’ angler. The full day version includes a delicious tropical lunch along with morning and afternoon tea for $179.00. Alternative 1 – Giant Trevally Popper Fishing -Travel a short distance to the fishing grounds, we cast a variety of Poppers (lures) for the awesome Giant Travally. Pound for pound this is one of natures greatest fighting fish. Lures will also attract other fish such as Queenfish and Mackeral. An experience every sports fisherman should encounter. Alternative 2 – Lure Casting Adventure -We sportsfish on 9kg braided outfits a wide variety of species such as salt water Barramundi, Goldern Travally, Mangrove Jacks, Cobia, Flat Head and many other species. We use a variety of lures to target these fish near untouched tidal areas. Fantastic bays, marinas and fringing reefs, giving us plenty of fishing options. “This is a lure casting adventure”. Maximum Passengers: 10 using both boats. Alternative 1 & 2 – 4 per boat. Inclusions – Rods & Reels supplied on ‘if lost, replace’ basis • All bait and lures included • Morning/afternoon tea and all refreshments • Fish are cleaned or filleted on board • Portable toilet available on request. We recommend you bring sunglasses, a hat, sunscreen and your own alcohol should you wish to. Dinner can be organised with your catch at Fish D’vine’s Restaurant in Airlie Beach. Michael & Sharon Pedulla, owners and operators of FishDive Charters & eco Tours, have combined their years of experience in diving and sports fishing to provide guests with a very personal and professional experience. 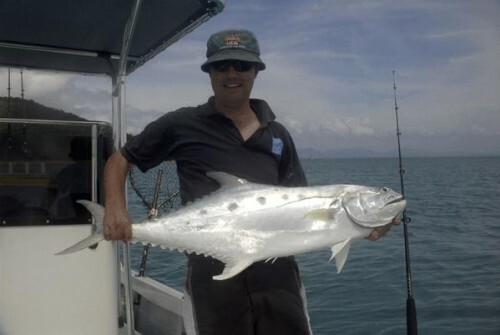 Michael has been involved with sport fishing and charter boats since 1989 as senior deckhand aboard many well-known Marlin Fishing vessels off the coast of Cairns. In 1997, Michael operated a Barramundi charter boat out of the trinity inlet in Cairns, and then achieved to combine both the Marlin and Barramundi seasons into many years of fishing experience. Sharon has been a hostess and guiding dives onboard vessels for 9 years, admiring the many pleasures of the under water world. 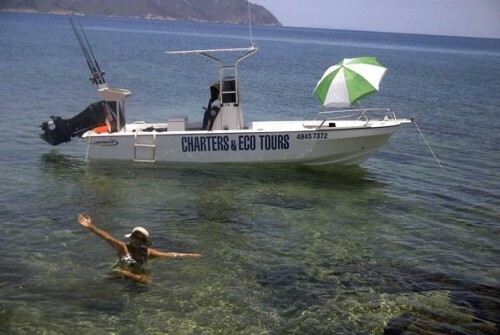 In 2005, Michael & Sharon relocated to the Whitsundays to build their dream tour company, and have since been assisting enthusiasts to fish and tour this eco friendly, pristine environment. The MV Kaya, is the perfect fishing platform and is designed for your maximum fishing comfort.M/V Kaya 1 is our 6 metre sportsfisher built for comfort powered by a 90hp four stroke motor. It has a shade canopy built in ice box, live bait tank with the ‘best in’ quality rods and reels. 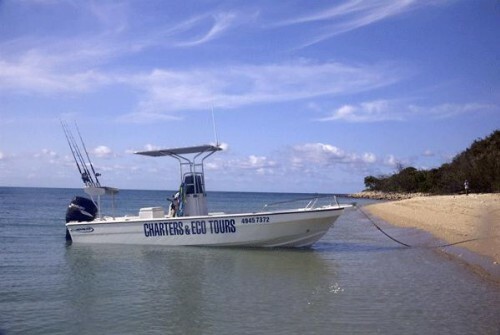 The vessel is designed for our live bait and offshore tours and can cater for a maximum of 6 guests. M/V kaya 2 is our new 5 metre sportsfisher powered by a 60hp four stroke motor and has a shade canopy, in- built ice box, with the ‘best’ in quality rods and reels. The vessel has been designed for our lure casting and popper (giant trevally) fishing tours and can cater for a maximum of 4 guests.